Modifier 79 with example usage | Medical billing cpt modifiers and list of medicare modifiers. The physician may need to indicate that the performance of a procedure or service during the postoperative period was unrelated to the original procedure. This circumstance must be reported by using the CPT modifier 79. This modifier is used when an unrelated procedure or service, by the same physician, is performed during the postoperative period (10 or 90 day global) of the original procedure. A new post-operative period begins when the unrelated procedure is billed. Provider performs right toe amputation on May 24, 2015. • Modifier 79 applies to surgical procedures performed on patients while they are in a postoperative period for a different, unrelated surgery. The new surgical procedure is performed to treat a new problem or injury. • Modifier 79 is required when reporting identical procedures that are performed on the same day, but are not repeats of the same procedure on the same anatomical site. • The unrelated procedure starts a new global period. • Do not report with modifiers 58 or 78. • Modifier 79 is an information modifier. On May 1, a patient undergoes a complex cataract surgery (66982) on her right eye, and then has the same surgery performed on her left eye on June 1. The second cataract surgery on her left eye would be reported as 66982-79-LT.
• To describe an unrelated procedure performed during the post-operative period of the original procedure. • The two procedures are performed by the same physician or physician billing group. • Pertains to all procedures codes with a 10-90 day global period. • Modifier 79 should be appended to the second procedure. • The procedure performed is related to the original procedure or a staged procedure. • If the services performed are related to the original procedure, it is part of the global period. • Cataract surgery is performed on the left eye. During the global period, cataract surgery is performed on the right eye by the same physician. (CPT code 66984-79-LT). • Patient has a repeat FEM-POP done on June 1st and is released from the hospital. A week after being home, patient is re-hospitalized on June 9th with renal failure. Hemodialysis is indicated and the same physician inserts a cannula for hemodialysis on June 10th the physician’s services for the insertion of the cannula for hemodialysis is unrelated to the FEM-POP performed during the previous hospitalization. (CPT code 36810-79). The longest global period for any procedure code from the original date of surgery applies to the entire surgical session and all subsequent services until the global period is complete. When using modifiers, choose the appropriate modifier for the situation, and use that modifier correctly. The failure to use a needed modifier when appropriate may result in denial of the subsequent surgery. The incorrect use of a modifier when not appropriate may also result in denial of the subsequent surgery. Modifiers 58, 78, and 79 are not valid to use with or attach to evaluation and management (E/M) procedure codes. Modifiers 58, 78, and 79 are mutually exclusive to one another; only one of these modifiers may apply to a service or procedure performed within a postoperative global period. Services may not be “unrelated” to the procedure code creating the postoperative global period and also “related” to another procedure code performed by the same physician during that same original surgical session. Modifiers 78 and 79 should not be used to distinguish multiple procedure codes performed during the same operative session. The postoperative period does not begin until the surgical session ends. This is not a valid use of modifier 78 or 79, and represents a billing error. During the initial surgery performed by this provider, a variety of procedures are performed on multiple skin lesions in multiple locations during the same surgical session. Neither modifier 78 nor modifier 79 should be attached to the procedure codes for the second and third lesions treated. Treatment of a second, separate lesion is correctly identified with the Distinct Procedural Service modifier (-59). ** Left eye cataract removal within the global period of right eye cataract removal is unrelated; submit with modifiers 79, XS, and LT.
** Right total knee replacement within the global period of left total knee replacement is unrelated; submit with modifiers 79, XS, and RT. ** 20610 (Arthrocentesis, aspiration and/or injection; major joint or bursa) performed on the operative joint during the global period is related. Do not report with modifier 79, 58, or any other modifier (*see general anesthesia exception below). o If performed in the office or at the bedside, 20610 is not eligible to be separately reported or reimbursed during the postoperative global period. This service is included in the global surgery package for the original surgery. o If general anesthesia is required with a return to the operating room, then 20610 is eligible for separate reimbursement for the intraoperative work; *submit with modifier 78. 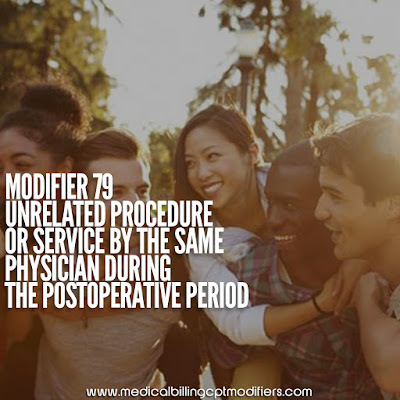 • Modifier 79 indicates the performance of a procedure or service during a post-operative period was unrelated to the post-operative care of the original procedure. • Append modifier 79 to the procedure performed. • Documentation should support the procedure code reported. Documentation of a different ICD-9-CM code from the original procedure is usually sufficient to support that the procedure is unrelated to the original procedure. • A new global period is initiated for the procedure reported with modifier 79. Modifier 79 applies to surgical procedures performed on patients while they are in a postoperative period for a different, unrelated surgery. The new surgical procedure is performed to treat a new problem or injury. Modifier 79 is required when reporting identical procedures that are performed on the same day, but are not repeats of the same procedure on the same anatomical site. Unrelated Procedure by the Same Physician During the Postoperative Period: The physician may need to indicate that the performance of a procedure or service during the postoperative period was unrelated to the original procedure. This circumstance may be reported by using the CPT modifier 79. ** Carrier may deny if modifier 79 is not included on the submitted claim. ** Claim should be submitted with a different diagnosis and documentation should support the medical necessity. ** The unrelated procedure starts a new global period. ** For repeat procedures on the same day, see modifier 76. ** Do not report modifier 79 with modifiers 58 or 78. ** Modifier 79 is an information modifier (not subject to payment reduction). The state’s claims processing system must recognize all of these modifiers and allow the PTP edit to be bypassed, if any of these modifiers is appended to the appropriate code of the edit pair with a modifier indicator of “1” and if the other conditions specified in the Claim Adjudication Rules section below are met. Failure to do this will result in incorrect denials of payment that will be incorrectly attributed to NCCI. After code pairs that match NCCI PTP edits in the edit file with dates of service within the effective period of the corresponding edit and with a column one code that is eligible for payment are identified, determine whether an NCCI PTP-associated modifier is correctly appended to either or both of the codes of the code pair. (i) If the modifier indicator of the edit is “0”, the column two code is denied (not payable) regardless of whether an NCCI PTP-associated modifier is appended. These edits cannot be bypassed. (ii) If the modifier indicator of the edit is “1” and if no NCCI PTP-associated modifier is correctly appended to either code, the column two code is denied. (iv) If the modifier indicator of the edit is “9”, both codes are eligible for payment. The corresponding edit is inactive and was deleted retroactive to its implementation dateis denied. Two modifiers are used to simplify billing for visits and other procedures that are furnished during the postoperative period of a surgical procedure, but not included in the payment for surgical procedure. When treatment for complications requires a return trip to the OR, physicians bill the CPT code that describes the procedure(s) performed during the return trip. If no such code exists, use the unspecified procedure code in the correct series, i.e., CPT code 47999 or 64999. The procedure code for the original surgery is not used except when the identical procedure is repeated. In addition to the CPT code, physicians report modifier “-78” (Unplanned return to the operating or procedure room by the same physician following initial procedure for a related procedure during the post-operative period). The physician may also need to indicate that another procedure was performed during the postoperative period of the initial procedure. When this subsequent procedure is related to the first procedure, and requires the use of the operating room, this circumstance may be reported by adding the modifier “-78” to the related procedure. When a CPT code billed with modifier “-78” describes the services involving a return trip to the operating room to deal with complications, pay the value of the intra-operative services of the code that describes thetreatment of the complications. Refer to Field 18 of the MPFS to determine the percentage of the global package for the intra-operative services. The fee schedule amount (Field 34 or 35 of the MFSDB) is multiplied by this percentage and rounded to the nearest cent. 3. an unrelated procedure during the postoperative period (modifier 79). If one of these modifiers is not appended, the service will be denied as included as part of the global period. Modifier 58 is used only if the procedure is billed by the same provider within the postoperative period of the original procedure, and is used by the operating surgeon only. If one of these modifiers is not appended, the service will be denied as included as part of the global period. Modifier 78 is used if a procedure is billed by the same or different provider within the postoperative period of the original procedure, and requires a return trip to the OR. An operating room is described as a place of service specifically equipped and staffed for the sole purpose of performing procedures. This can include cardiac catheterization suites, laser suites, endoscopy suites and ambulatory surgery centers. It does not include a patient’s room, a minor treatment room, recovery room or special care unit such as CCU, ICU,or NICU. Modifier 79 is used with major or minor surgical procedures to indicate an unrelated procedure was performed by the same provider during a postoperative period of the original procedure. If one of these modifiers is not appended, the service will be denied as included as a part of the global period. 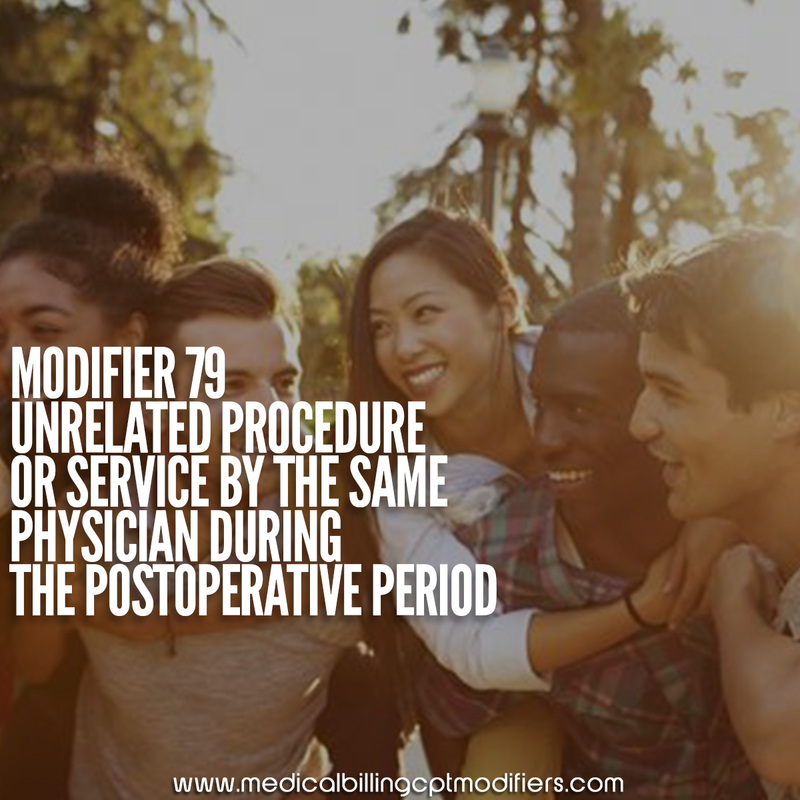 Modifier 79 is used when an unrelated procedure is billed by the same provider within the postoperative period of the original procedure. Billing • Modifier 79 indicates the procedure is unrelated to the original service or procedure. Example: A total knee replacement (27447) is performed. Within the 90-day follow-up for the knee replacement, care for a colles fracture of the wrist (25620) is provided. Procedure code 25620-79 should be submitted. • All codes on the major and minor lists can be billed with modifier 79 with the exception of the multiple session codes listed below. Major surgery and minor surgery code lists are published in the April, 1999 Medicaid bulletin. • Multiple session codes should not be used with modifier 79. The following codes describe procedures that require one or more services in order to complete the procedure. The fee schedule amount allows for each segment included in the procedure, therefore, additional reimbursement cannot be given per session. A patient undergoes a Total abdominal colectomy with end-ileostomy. and than is undergoes a reversal of ileostomy with in the global period which modifier do I use 78 or 79?? A patient has a Total abdominal colectomy with end-ileostomy. And than undergoes a reversal of ileostomy within the 90 day global, which modifier should I use? 78 or 79.